Corian ® is an innovative material for countertops, backsplashes, showers, sinks, and other surfaces. It has the beauty and durability of stone, but it is a consistent material all the way through its thickness. If you cut into Corian ®, it will look the same inside as it does outside. One of the biggest benefits of Corian ® is that it can be molded to take just about any shape. The material is created from a blend of acrylic polymers and stone aggregate, and it hardens into the shape of whatever mold it is placed in. The resulting pieces have no seams, which creates a beautiful, modern aesthetic and reduces the need for maintenance. Liquids and crumbs can’t pour into the cracks and set in stains. Corian ® has continued with its innovation to introduce technical capabilities that are the wave of the future! Over time, Corian ® has gotten even better with the introduction of more than 100 colors and patterns. These surfaces can now include veining, mottling, and other patterns that make them look like marble and other natural stone. It seems hard to imagine that Corian ® could get any better than what it is, but we’ve been proven wrong. Corian ® has continued with its innovation to introduce technical capabilities that are the wave of the future. We all have a jumble of cords and phones sitting on our countertops. Some of us use charging stations, but that just hides the cords and still takes up space on the counter. The new Corian ® counters may change all that. At the NeoCon Convention in Chicago last year, DuPont introduced the next innovation in Corian ® countertops: Wireless charging stations. These new countertops have the wireless charging technology built right into them. The charging station is not a separate unit — it is embedded seamlessly into the countertop. The charging station includes a power mat that supports PMA and Qi compatible devices, such as the Samsgun Galaxy 6. All you have to do is rest the phone on the mat to charge it. You don’t have to plug anything in. For phones that don’t work with this technology, such as the iPhone, you can buy a power ring that plugs into the phone. You then set the phone on the charging pad, and the ring charges the phone. With these new countertops, you can set up a wireless charging station in your kitchen, your bathroom, or even on furniture like a side console or buffet. You can streamline your decor and create a more modern aesthetic for your room. Plus, you’ll be able to quickly charge your phone without having to mess with any cords. The power stations also offer additional features such as device diagnostics, and they can send push notifications to your other devices when charging is finished. To get the Corian ® countertops with the built-in charging stations, you have to custom order them from a participating manufacturer. You will have to pay for the counters plus a couple hundred dollars extra for each charging area. You can have as many charging pads installed in the countertops as you have the budget and room for on the space. Like other elements of Corian ® countertops, the stations can be installed seamlessly. You can also choose the design of the counter, from the shape to the color to the pattern. Maintaining your Corian ® countertops is especially important with these charging stations installed. While Corian ® is durable and resistant to most water damage and stains, it is not invincible. You will need to keep the counter free of major scratching that can allow liquid and dirt to settle and breed bacteria. Also, any stains or other defects on the counter top will stand out significantly because of the eye-catching technology. 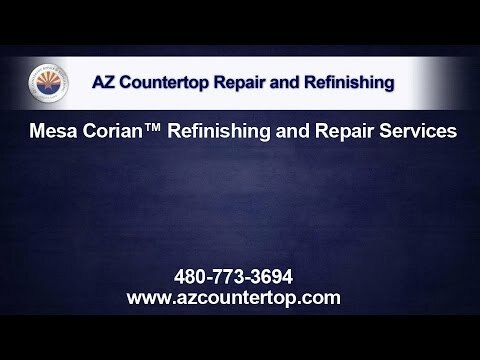 AZ Countertop Repair and Refinishing provides services to keep your Corian ® countertops looking beautiful. We can refinish Corian ® countertops to remove surface scratching, or we have solutions to repair deeper scratches and stains. Our maintenance and Mesa Corian ® repair services will ensure that your countertops look great while also adding years to their life. Our experienced technicians can make the repairs without damaging nearby elements, such as these wireless charging stations or tile backsplashes. Call us today to find out how we can help you with your Corian ® counters.